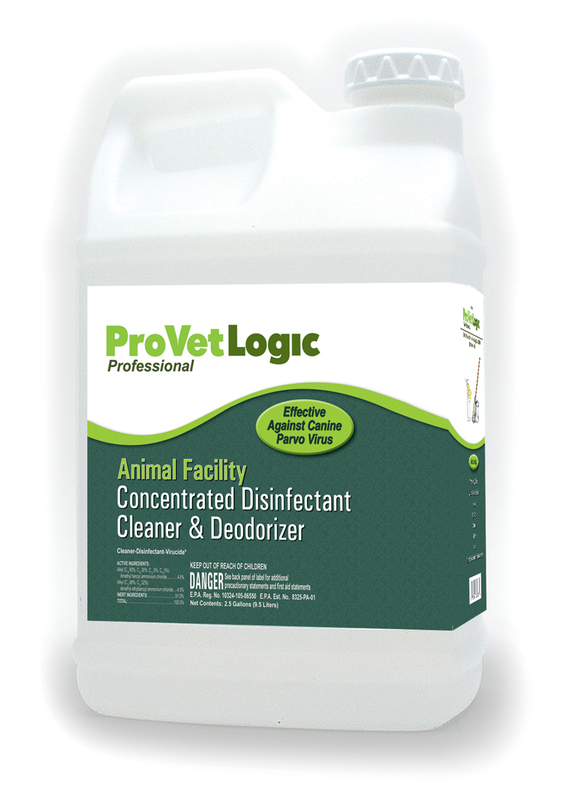 ProVetLogic Professional Animal Facility is a highly effective product for use on hard nonporous surfaces in animal care facilities. 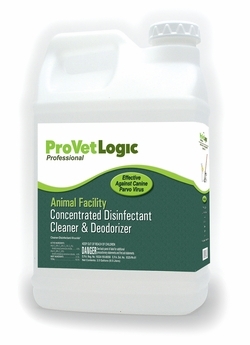 This disinfectant is highly concentrated for economical use and is effective against 32 animal specific viruses, bacteria and fungi, as well as a variety of human diseases, including MRSA and H1N1. EFFECTIVE AGAINST CANINE PARVOVIRUS (please visit the Products Tab for a complete list of kill claims and use instructions) Read about our Efficacy Data. General Disinfection: Add 1 ounce of this product to 1 gallon of water. Canine Parvovirus: Add 4 ounces of this product 1 one gallon of water. Virucidal Performance: This product is effective against the targeted viruses at 1 to 1.25 ounces per gallon of water or equivalent dilutions.